The summer solstice occurs once a year, and there is also a winter solstice each year. During both solstices, the tilt of the Earth’s axis is at its extreme either toward or away from the Sun. The tilt of the Earth does not actually change – it stays at 23.5° – however, the Earth also orbits the Sun causing different regions to be exposed to varying degrees of sunlight. The word “solstice” has its roots in Latin from the words for “sun” and “to stand still.” This is because during the solstices, the Sun appears to stand still, and then it starts moving in the opposite direction in our sky. It begins to get lower in the sky, and the length of daylight starts getting shorter in the Northern Hemisphere. In addition to the two solstices, there are also two equinoxes, which is where the days are of equal length at the equator. The tilt of the Earth is also responsible for the change in seasons we experience. During the summer solstice, the Suns is directly over the Tropic of Cancer. The summer solstice is the longest day of the year – the longest time there is daylight – in the Northern Hemisphere. It is the opposite in the Southern Hemisphere however with the winter solstice being the longest day of the year. The exact date of the summer solstice moves around somewhat because of the way years are set up in the Gregorian calendar. For example, it fell on June 20th in 2000. Usually, however, it is on June 21st. 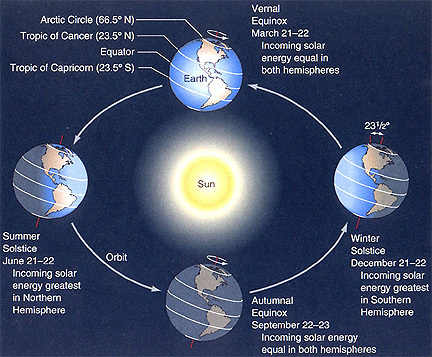 In some cultures, the solstices, and the equinoxes, represent the start of the seasons while they are the midpoint in other cultures. The summer solstice is the beginning of summer in America. The summer solstice has long been a time for celebration for many different cultures. Midsummer was a holiday celebrated in various European cultures. Traditionally, Midsummer’s Day falls on June 24th, several days after the actual solstice. The Midsummer celebration of the ancient Gauls was known as the Feast of Epona. In China, the summer solstice celebration represented yin, earth, and the feminine while its opposite – the yang – was celebrated during the winter solstice. Germanic, Slav, and Celtic tribes in Europe used to celebrate Midsummer with huge bonfires. Jumping through the fire was supposed to grant protection to people and bring love. The bonfires were also supposed to lend their power to the Sun, which would begin to wan as winter approached. Universe Today has articles on the shortest day of the year and the declination of the Sun that will help you learn more about the solstices and seasons. If you are looking for more information, About.com has a number of good articles on the summer solstice and Science World has some great articles and resources.